There’s a giant chicken at the corner of Western and Oakwood avenues. Some people think it looks like a bucket, the standard receptacle for fried chicken. But to me, it’s always been a chicken, its beak pointing northeast, its feathers pointing to the intersection, and its comb stamped with the disembodied head of Colonel Sanders. 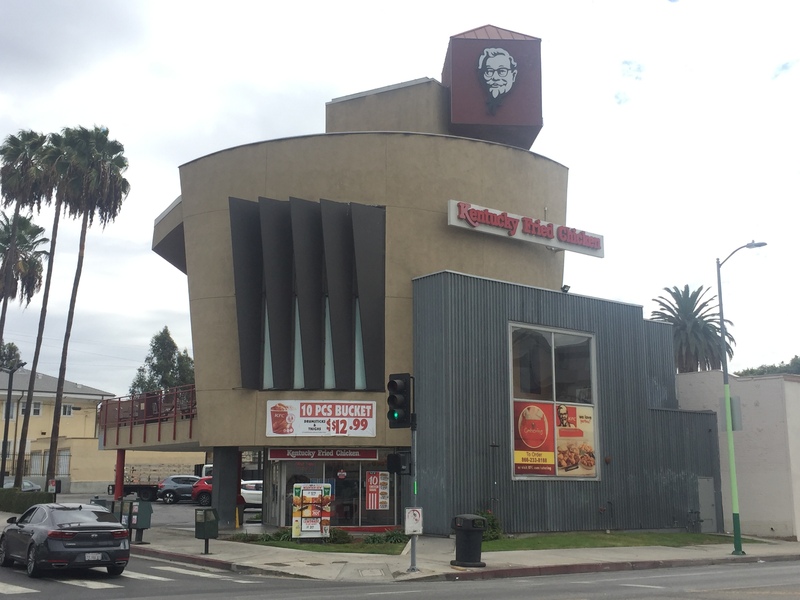 The infamous two-story KFC (technically located in East Hollywood) has repeatedly been named one of the ugliest buildings in Los Angeles, but it also has a fascinating architectural pedigree. 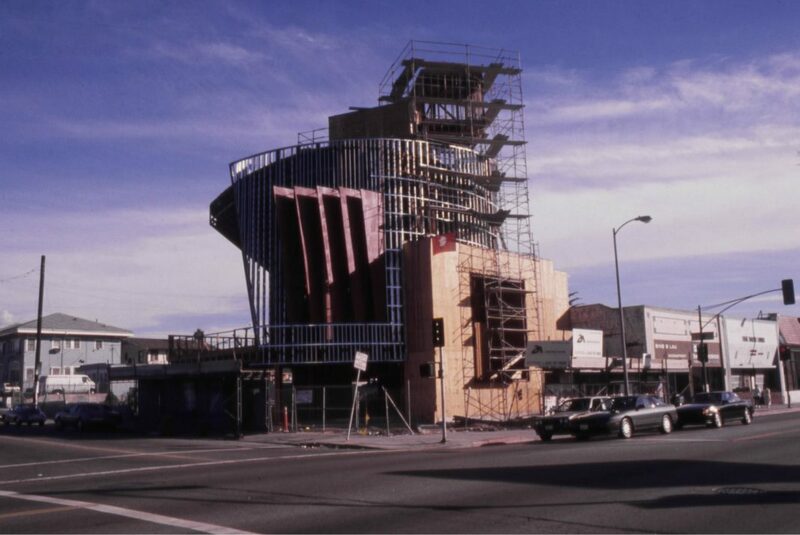 Built between 1989 and 1990, it was commissioned by KFC franchisee Jack Wilkee, who wanted to “challenge the notion that all KFC franchises should have the same standard design of fake mansard roofs (and) outsize Colonel Sanders bucket,” he told the L.A. Times. When designing the KFC, Daniels wanted to make a “very structurally dynamic” building. While most fast food restaurants are surrounded by a parking lot, the KFC stands proudly at the corner with the parking hidden behind it. This recalls another L.A. architectural innovation; John and Donald Parkinson designed the art deco Bullocks Wilshire with a rear parking so the building and its wares could stand out more. Daniels says the KFC was designed similarly, calling attention to itself as part of the fabric of the city. The two-story KFC certainly catches the eye with its size and constructivist design. In a way, it interacts with the intersection, as you can stand outside and watch through a large window as people climb the stairs to the dining area on the second floor or sit on the building’s jutting balcony and take in the view of the intersection and Hollywood Hills. Amazingly, despite Daniels’ intent to create a dynamic eye-catching building, he never had a chicken theme in mind. “It’s been called a bucket and a chicken, but this wasn’t a self-conscious thing,” says Daniels. The intent was to create a constructivist building, but it’s been interpreted as a modernist take on programmatic architecture. There was a time when programmatic architecture, a kind of novelty architecture in which a building was shaped like what the business sold or was called, like the hat-shaped Brown Derby restaurant or the armada of boat shaped buildings around town, was everywhere in L.A. It’s no surprise people assume this fancy chicken shack is part of that genre.